Jasmin Caton prepares gear for the first ascent of the route that leads up and over the arch feature in the background. Vince Hempsall photo. 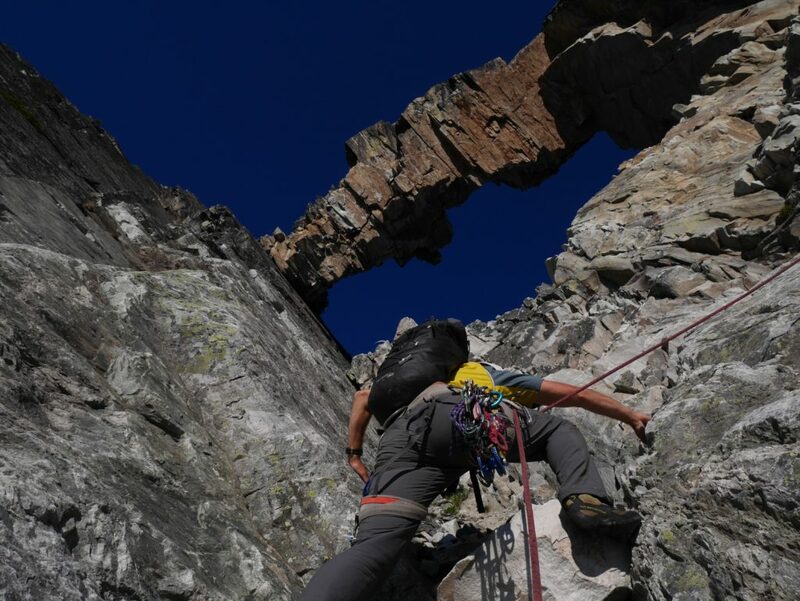 Last July professional photographer Steve Ogle, ACMG guide and Patagonia athlete Jasmin Caton, and I climbed a new route up a beautiful natural rock arch feature in the middle of the Purcell Wilderness Conservancy. 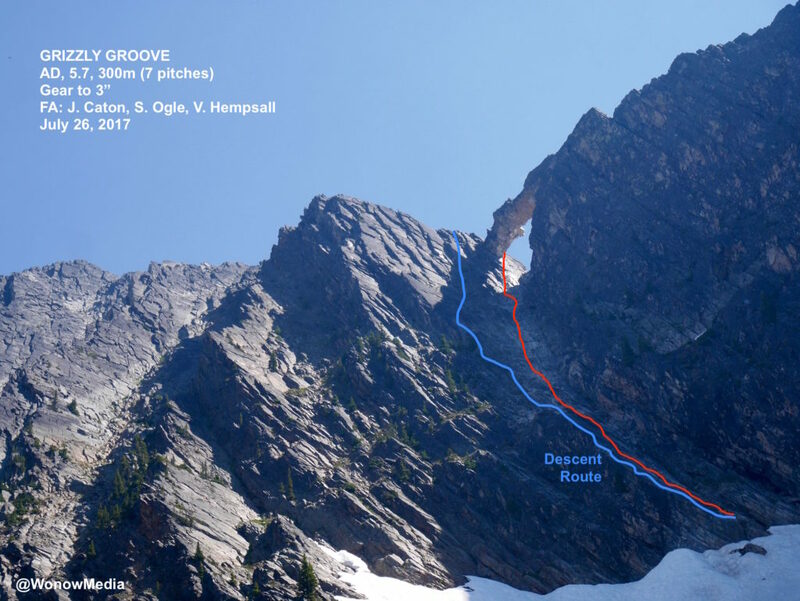 The entire adventure is detailed in my article coming out in the Canadian Alpine Journal this Spring but below you’ll find the description of the new seven-pitch route we put up on the arch called “Grizzly Groove.” The name is to honour the Ktunaxa nation that refers to this Jumbo-Toby Creek watershed area as Qat’muk, a sacred place where the Grizzly Bear Spirit is born, where it celebrates in ceremonial dances, and where it eventually dies. 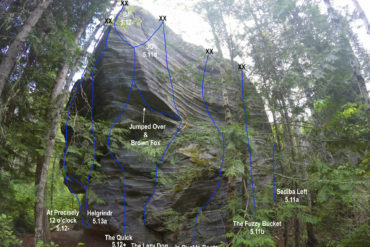 If you’re visiting this incredible piece of rock, please be respectful of the importance of this area, both culturally and environmentally, and leave no trace. 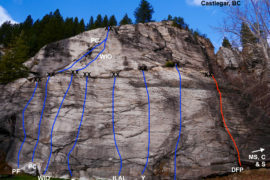 Steve Ogle photographs Jasmin Caton on the 5th pitch of the Grizzly Groove. Vince Hempsall photo. 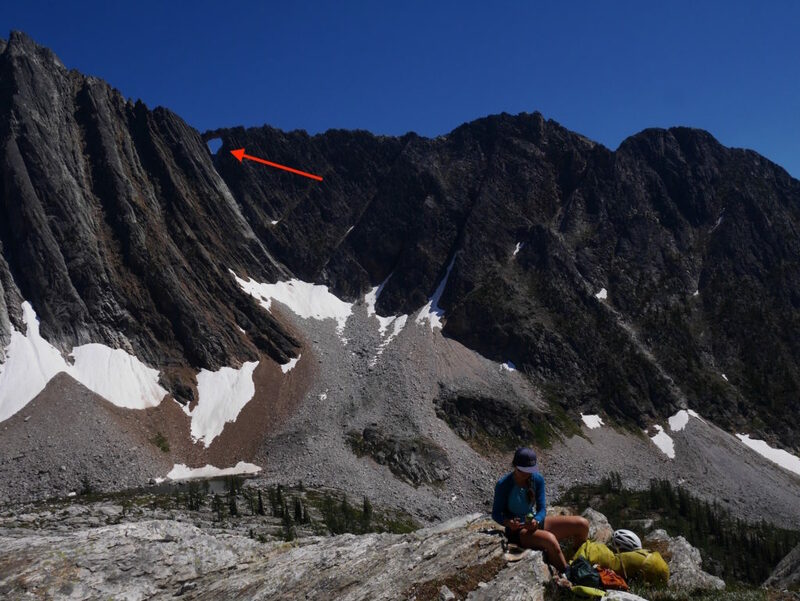 From the parking lot of the popular Monica Meadows camping spot in the West Kootenays, hike the trail for about 45 minutes and, when it flattens out, veer off it in a south-west direction aiming for an obvious talus slope that leads through a col on the other side of the drainage. Walk through the mostly open areas past bogs and over streams and up the talus through the col. Another 75 minutes of hiking through meadows veering in a south-east direction will bring you to a tiered system of small alpine lakes at the base of the ridge where the arch is located. All told it was a surprisingly easy three-hour hike. From the lake closest to the arch, hike up the talus and, depending on the time of year, the snow slope, make the awkward move past the bollard and cautiously step through loose gravel and stones to reach the main corner that leads to the arch. The rock in the corner is too chossy to climb but there’s good quality rock on the slab about five metres to climber’s left. Start there. Grizzly Groove topo. Wonow Media copyright. All rights reserved. Gear: 1 full set of Black Diamond camalots from 0.2” to 3” plus doubles of a #1 and #2. Gear belays. 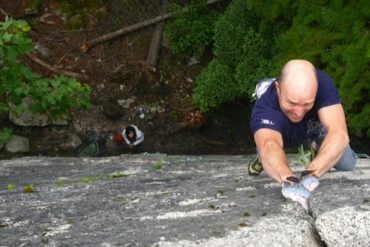 Two 60-metre ropes and webbing necessary for rappels. P1. 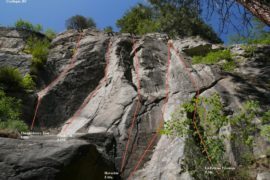 5.7, 45m: There are many loose rocks at the base of the route as well as spread throughout different sections so tread lightly and be aware of your rope. Start 4 metres to the left of the main corner and climb the low-angle slab to a large ledge. 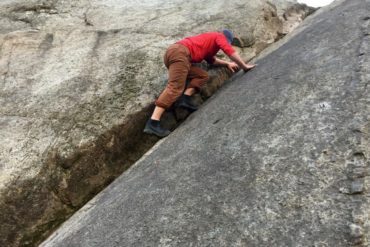 P2: 5.5, 60m: Continue up the slab, placing small pieces in discontinuous cracks to a small stance. P3: 5.5, 60m: Same as above. 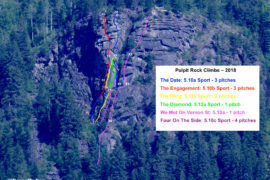 P4: 5.7, 60m: The wall steepens slightly here. Continue up and then veer right to a stance about 20m under the south side of the arch. P5: 5.7, 20m: Move up through the large loose blocks to a stance beside a triangle-shaped horn on the north side of the arch. P6: 5.7, 60m: Step right, then down climb three metres before traversing right and into a dihedral. Place gear then continue up and right to another fist-sized corner crack. Follow this to its termination then step left into easy terrain to the top. The quality of rock on this pitch is spectacular and the jamming is excellent. P7: If you’re so inclined, climb onto the top of the arch. 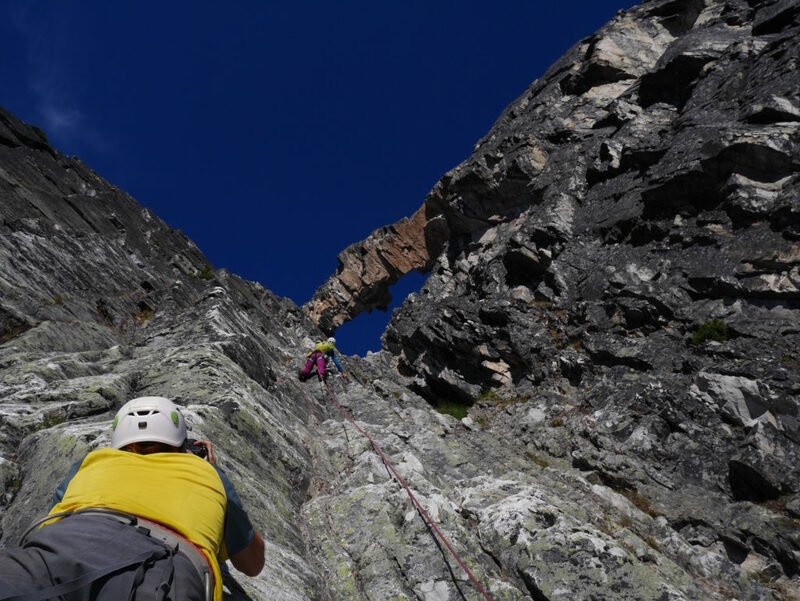 From a spot about 10m down the east side of the main ridge make an awkward move over a chasm onto the arch proper and climb the easy terrain (5.7) making sure to go over the large boulder feature rather than around it. Descend the way you came to the main ridge. Steve Ogle leads the 6th pitch of Grizzle Groove. Vince Hempsall photo.